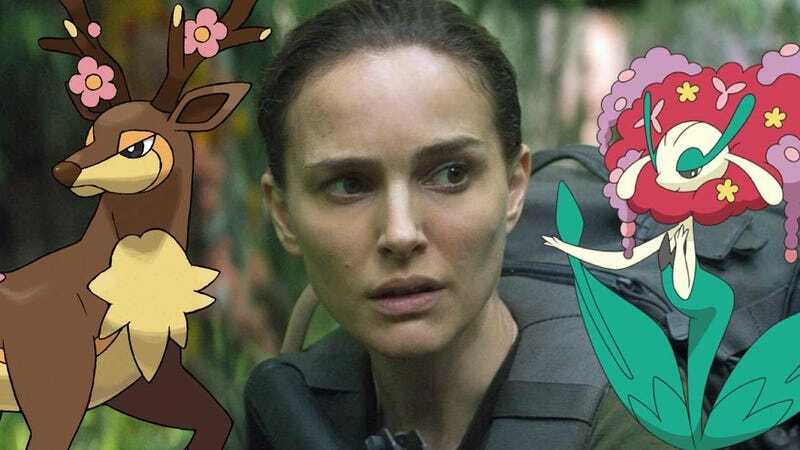 From left to right: The Pokémon Sawsbuck, Natalie Portman as biologist Lena in Annihilation, and the Pokémon Florges. To everyone marveling at how imaginative and wondrous all of Annihilation’s fantastical, mutated creatures are, you realize they’re all just Pokémon, right? We’ll explain below—but it will involve a great number of spoilers for the film, so beware. The vast majority of Alex Garland’s Annihilation takes place within the Shimmer. It’s a mysterious area around a lighthouse where an extraterrestrial being crashes and creates an expanding bubble in which the DNA of all organic things is refracted and remixed, causing spontaneous mutations. The mutated creatures within the Shimmer are as beautiful as they are terrifying and dangerous, but what struck me most about seeing them in the movie is just how strikingly similar they are to a number of monsters from Nintendo’s Pokémon franchise. From left to right: An example of the Pokémon Sawsbuck in its Spring Form and two Shimmered deer-like creatures with flowers growing from their antlers. One of the first creatures biologist Lena (Natalie Portman) encounters during her expedition into the Shimmer is a pair of graceful, deer-like creatures whose exposure to the mutating bubble causes them to manifest flowers that grow from their antlers. These unnamed creatures closely resemble the Spring form of Sawsbuck, a fifth-generation Pokémon whose body transforms along with the seasons. In its Spring form, the Sawsbuck, like the monsters from Annihilation, grow clusters of pink flowers from their horns. You could also make the case that Annihilation’s creatures were inspired by Xerneas, the fairy-type legendary from Pokémon X and Pokémon Y. From left to right: Lena (Natalie Portman) inspecting a Shimmered crocodile whose genes have been mixed with those of a shark and Feralgatr, a water type Pokémon. Unlike the peaceful deer monsters, the alligator creature the team encounters as they venture deeper into the Shimmer is openly hostile; it actually tries to kill physicist Josie Radek (Tessa Thompson). When Lena discovers that the animal has concentric rows of serrated teeth like a shark, the team begins to realize there’s way more to the Shimmer’s strange creatures than meets the eye. Here, it becomes clear that whatever this thing is, it has more in common with a Feralgatr, the final evolutionary form of Pokémon Gold and Pokémon Silver’s water starter Totodile. Presumably, the Shimmered gator, like Feraligatr, is a completely amphibious creature capable of breathing underwater and making deadly charges at prey while on land. From left to right: The expedition team comes across a man’s body that’s been transformed by the Shimmer into a fungal growth and Amoongus, a fungus Pokémon. All of Annihilation’s creatures are blends of organisms that wouldn’t be able to crossbreed under normal circumstances, but one of the Shimmer’s creations stands out as being particularly horrifying when we see it in its final form. Early in the film, the team stumbles across a video recording of the team that came before them, who ultimately either fell prey to the Shimmer’s monsters or were mutated out of existence by it themselves. In the video, you can see that a man’s organs were at one point writhing around inside of him like large earthworms—and by the time the latest team finds his remains, what’s left of his corpse has been transformed into a sprawling fungal growth that exploded from somewhere within his guts. It’s a wee bit of a stretch, but this man calls to mind Foongus and Amoongus, two vaguely humanoid fungus Pokémon from the fifth generation. From left to right: Florges, a Pokémon resembling a humanoid bouquet of flowers, and Tessa Thompson as physicist Josie Radek in Annihilation. It goes without saying that almost everyone who ventures into the Shimmer doesn’t end up making it out But some of the people who die within it are lucky enough to experience deaths that are peaceful. Josie is actually the first of the scientists to deduce that the Shimmer refracts living things’ genetic code the way a prism refracts light. She comes to the conclusion after realizing that a number of floral growths within the Shimmer appear to be shaped like human bodies, something she theorizes is the result of plant DNA being spliced with human hox genes, the genes that define the general body plan for multicellular organisms. Rather than trying to escape the Shimmer, Josie chooses to become part of the new ecosystem and literally becomes a piece of living, human-shaped topiary—a being similar to a number of grass Pokémon, like Bellossom, Roselia, Roserade, and Florges. From left to right: A Shimmered bear-like creature inspecting Lena (Natalie Portman) to determine whether it should eat her and Bewear, a dangerous Alolan Pokémon styled after a bear. Surveyor and geologist Cass Sheppard (Tuva Novotny) is the first member of the team to be killed by one of the Shimmer’s creatures—a mutated bear with vicious fangs and the ability to mimic human voices. Well, one human voice, at least. There are quite a few bear Pokémon, like Teddiursa, Ursaring, Pancham, and Pangoro, but weirdly enough, Annihilation’s demon-like bear creature has the most in common with Bewear, seventh generation normal/fighting dual type. Like the Shimmered bear, Bewear is known for mimicking the behavior of humans (though Bewears are known for waving like people and not speaking) and being incredibly dangerous creatures. A Bewear’s warning is less of a greeting and more of a warning that they’ll crush you to death if you get too close. Annihilation’s bear also has an exposed cranium reminiscent of the literal Marowak skulls that Cubone are most often seen wearing. From left to right: Lena comes face to face with the source of the Shimmer and all four forms of the DNA Pokémon, Deoxys. Lena makes it to the impact site where the being responsible for the Shimmer first landed, and by the end of the film she has a fascinating, confusing interaction with the alien. In Lena’s opinion, there’s a good chance that the Shimmer alien arrived on Earth not fully understanding where it was or what kind of influence it might have on the local wildlife. More than that, Lena theorizes that the alien might not have even fully understood what its very self was, something hinted at when the alien confusedly transforms itself into a replica of Lena before she tricks it into killing itself with a phosphorous grenade. In many ways, the Shimmer and whole of Annihilation shares a number of similarities with Deoxys, the third generation Pokémon who stars in the seventh Pokémon movie Destiny Deoxys. Like Annihilation’s alien, Deoxys is an extraterrestrial creature that first crash lands on earth only to be confused by its new surroundings, prompting it to project a luminous, multi-colored light into the sky that acts as its form of communication. Annihilation is almost certain to leave you with more questions than you had going into the movie, but the real takeaway from the movie is simple: As cool as Pokémon may be, actually living with them in the wild would be incredibly hazardous, and would require that all Pokémon trainers travel alongside groups of heavily-armed scientists.